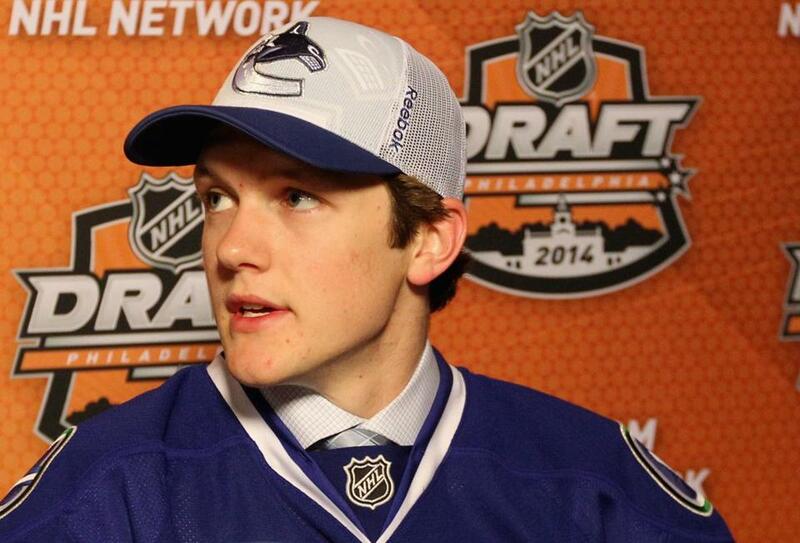 The Canucks picked Thatcher Demko 36th overall. The youngest hockey player in the NCAA last season, Thatcher Demko, was the sixth player selected on Day 2 of the NHL Draft on Saturday. The Boston College goalie was taken by the Vancouver Canucks with the 36th overall pick, capping quite a year for the San Diego native. Demko, who had a .919 save percentage and logged 1,446 minutes as a freshman, helped BC to the Frozen Four last season. He had two shutouts and a 16-5-3 record, with his standout performance coming in the Northeast Regional final when he made 29 saves against UMass-Lowell in the Eagles’ 4-3 victory. Demko turns 19 on Dec. 8. Two Boston natives were selected in the draft. Liam Coughlin, who was a Globe All-Scholastic for the 2012-13 season, was drafted 130th overall by Edmonton. As a senior for Catholic Memorial, Coughlin had 28 goals and 22 assists and led the team to a Super 8 appearance. The Boston University-bound forward spent last season with the Vernon Vipers of the BCHL, scoring 18 goals with 27 assists. Cameron Darcy, a forward, was taken 185th overall by Tampa Bay. Darcy, of South Boston, played last season with Cape Breton of the QMJHL, scoring 35 goals to go with 47 assists. BC had two incoming freshmen taken in the first round Friday. Forward Sonny Milano went 16th overall to Columbus and forward Alex Tuch went 18th to Minnesota.